Ehcolo are the Danish packaging machinery company best known for their high-quality palletiser and turnkey packing lines for bagging, palletising, stretch wrapping and hood stretching. 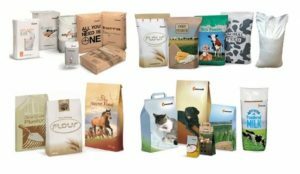 With such a wide range of leader brands such as T2 for Continuous motion VFFS, Payper for pre-made bags, sacks and tubular FFS, plus the Lachenmeier hooder, provides a customised solution for all needs. The machines can pack and palletise up to 2,200 bags per hour – and their unique function of preforming the bags before flattening with the sturdy high-pressure bag flattener ensures tight and stable packing for transport. Energy efficient – by reusing all braking energy, the kinetic energy produced reduces all over power consumption by between 10-20% compared to traditional bagging machines. Save time – there is no need for manual entering of the machine or homing procedures as the coders enable immediate restart after a power failure. The VPN router connects to the standard IP network giving quick world-wide remote support in the case of breakdowns. User friendly – remote access of the controllers that give a clear view of machinery operation. These bagging machines and palletisers are particularly suited to the agricultural industry such as; flour milling, grains, cereals, rolled oats as well as garden products such as fertilisers, seeds, mulch and manure; bulk animal feed, minerals and chemicals. Call our office on 1300 525 669 or contact us for more information on how an Ehcolo bagging machine and palletiser can help your company fill bulk orders quickly and reliably.